It’s not like I needed new ways to fix sweet potatoes- I was already an addict. 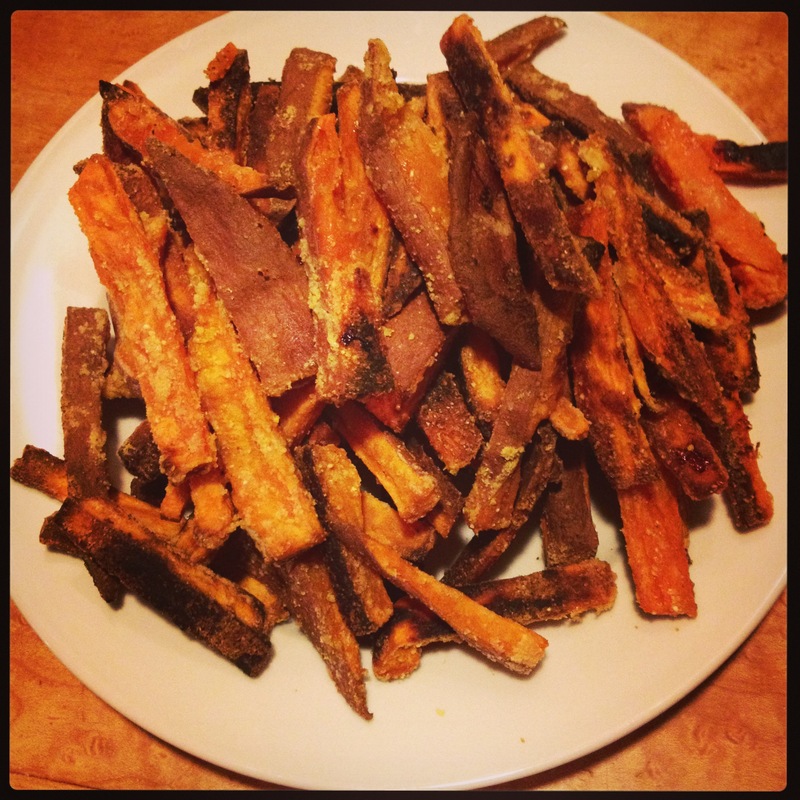 But I came across this recipe, and I was tempted by the promise of crunch, since I usually settle for soggy-but-still-good sweet potato fries. I followed it pretty much to the letter, including using the coconut oil and shaking the mixture in a ziploc (strangely satisfying by the way). The fries blew all my past attempts out of the water. They were so good that my dinner guests ate them sans ketchup, and they disappeared rapidly. See the crunch on these bad boys? Then I started craving a sweet potato sandwich, so I made this springy little tortilla grilled cheese on my panini press. Just before it got topped with the second tortilla and went into the panini maker. Instructions are simple: Make pesto by combining 2 cloves garlic, walnuts, kale pieces that have been torn off the stem, the juice of one lemon, and olive oil in a food processor. Add salt to taste. 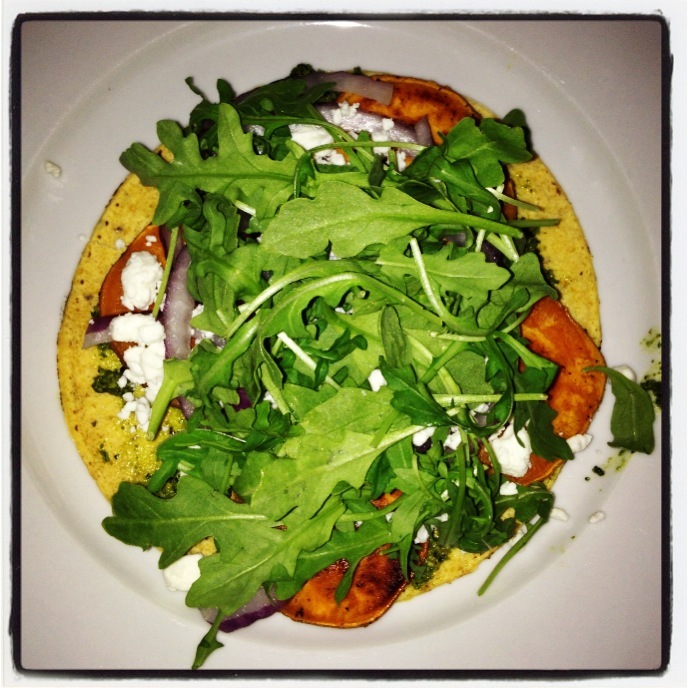 Spread one corn tortilla with pesto. Layer sweet potato coins that you have roasted in the oven for 10 or so minutes at about 375 F. Then add red onion slices (you can soak them in cold water to diminish their bite, but still I wouldn’t eat this before a job interview or anything.) Add a pile of arugula and a sprinkling of goat cheese and then your second tortilla. Then heat the pressed sandwich until the cheese melts and the tortillas get crispy. This would be an excellent lunch for anyone working from home while STARTING AN MBA, or taking a break from renovating their BRAND NEW HOUSE, or anyone taking lil’ vacation before becoming a SUPER FANCY DOCTOR AT AN AWESOME RESIDENCY PROGRAM. Just for example.